Diamonds Athuruga - All Inclusive is the case when "if it works, why change something." This resort was one of the most effective and invariably popular in the country, but today Athuruga has undergone great changes and represents only the best side of the Maldives. In a nutshell, everything is fine. Only when you see a strikingly fresh, light and modern Athuruga, you probably think, yeah ... well, maybe it's a little outdated (it was built in 1990). The leading Italian architect has changed all aspects of the former hotel and created a new design for 25 Water Villas. With stunning views, the public area was open to the beach and a white color contrasting perfectly with turquoise waters is widely used throughout to give an amazingly airy and sublime feel. The panels of the original coral walls are clearly visible around the resort, giving the island an authentic Maldives style. The old main bar is now a pizzeria. A new bar, a new restaurant and a new reception desk were provided with white sand floors, white cotton curtains and light brown wood furniture. Everything is very attractive, in a literal sense: all the elements beckon you to go and explore. A new boutique and store for divers can also be included in this new list. In the lounge near the reception you will find the only TV in the hotel, as well as a computer and wifi, but, I must say, the rates for use are quite high. For guests of water villas there is free WiFi in every room. Guests also receive an iPod docking station and can borrow an iPod if there are needs. All guests use on a generously all-inclusive package that includes free water sports, laundry, 1 island tour, and of course all meals, snacks and drinks, with the exception of champagne and premium brands of cognac and whiskey. Special lounge in the Maldivian Air Taxi terminal is also a nice bonus. 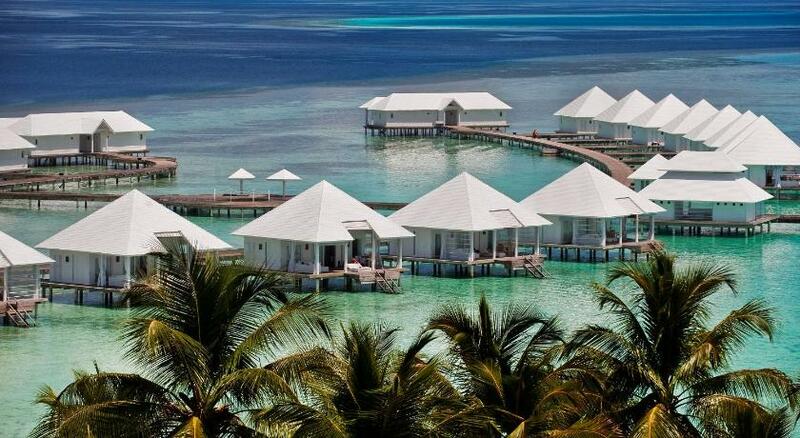 The resort's water villas have their own fabulous, new over-water restaurant. The hotel has entertainment every day, with music before and after dinner, and a few shows or quiet games in the evenings. Built in 1990, a trendy, well-organized resort with a light and easy atmosphere and in excellent style, the Italians-run Diamonds Athuruga has done an impressive job of renovating the property. Bring a dark sunglasses with you, because if the bright sun, reflected from crystal clear turquoise waters and soft white sand does not blind you, it will make chic and impeccable white furniture. 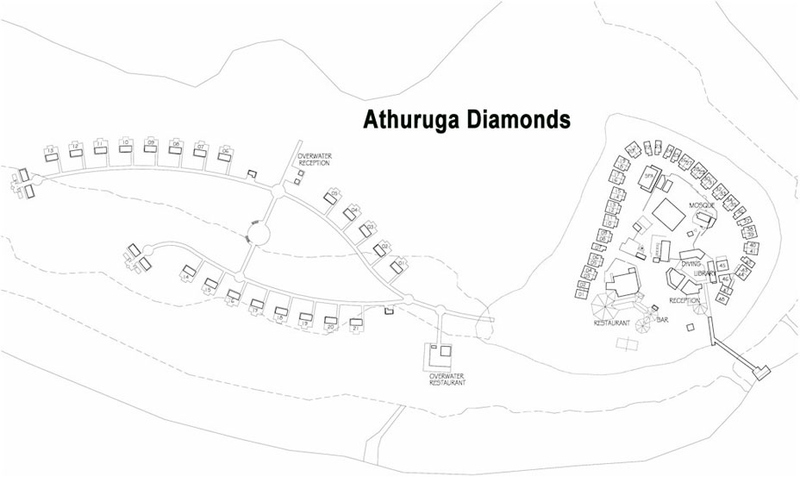 Where the hotels in its category in the Maldives can overlook some details, Diamonds Athuruga keeps them at the castle. It's hard to find a pillow not in place, or a non-staff member of a staff member. Although it seems that some of the more frequented areas (for example, a TV lounge) could use a TLC drop, it's really only in comparison with the rest of the hotel. Athuruga is certainly cosmopolitan and hotly open to all nationalities, but it is fair to say that the hotel has Italian features. Many Italian staff and most of the local staff speak Italian. Entertainment, as a rule, is multi-lingual. Expect a lot of Italians during the high season, with the Germans and possibly the British majority at other times of the year. Located on a tiny and picturesque private island in South Ari Atoll, Athuruga sits on the shore that is surrounded by a shallow house reef with an abundant marine life, ideal for snorkeling with colorful fish. Nevertheless, you should not miss a snorkel excursion to neighboring spots with turtles, sharks and rays. Thanks to the convenient location in the Ari atoll's heart, guests will find that the water here is much quieter than around the sister property of Diamonds Thudufushi. 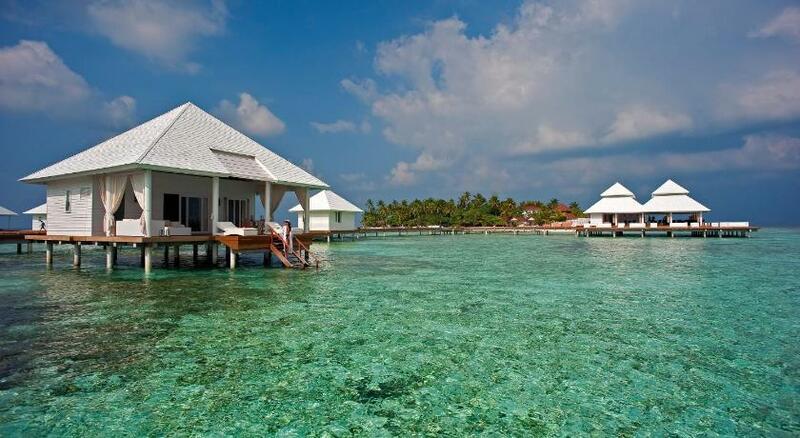 Diamonds Athuruga Island Resort lies at about 20 minutes scenic-flight by seaplane from Male International Airport. 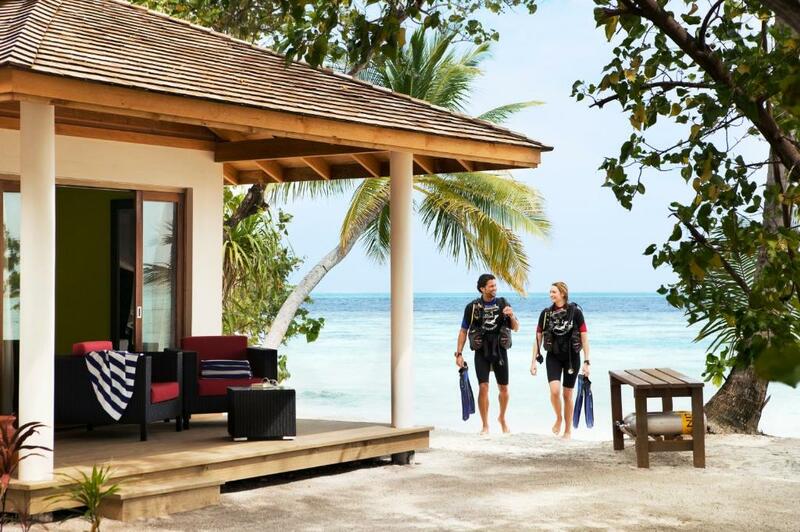 A holiday at Athuruga is a real Robinson Crusoe adventure with all the advantages of perfect services. Because of the proximity of the house reef, flights land on a floating jetty and guests are taken by boat to the resort's arrivals dock. Design wise, 44 Beach Bungalows, 3 Junior Suite 21 Water Villas and 2 Two Bedroom Water Villas occupy the exclusive Diamonds Athuruga Beach & Water Villas. The inimitable elegant Italian décor offers our guests every comfort, guaranteeing an exclusive stay in an oasis of calm tranquillity. Facing the unspoilt waters and with direct access to the beach, the 44 Beach Bungalows are equipped with verandas with private terraces featuring armchairs, tables and sun loungers. All of the rooms feature an outdoor shower. 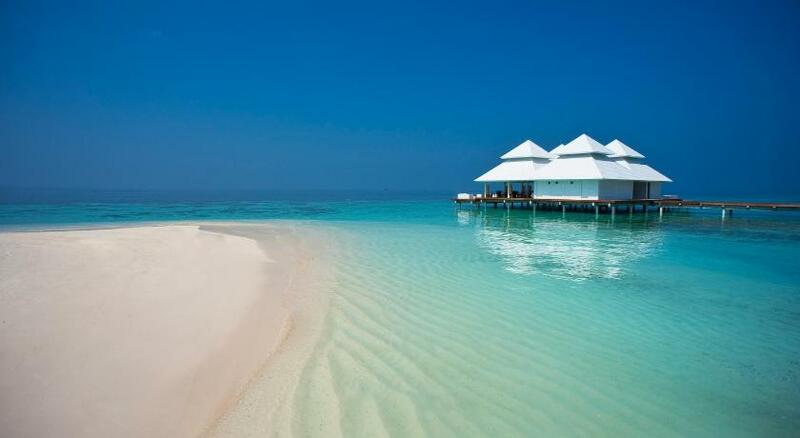 Owners of beach bungalows are advised to upgrade to Overwater Villa for at least a few days stay. 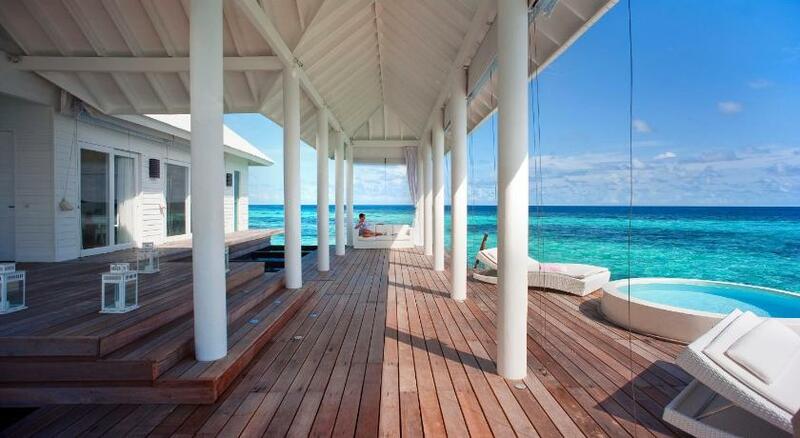 Not because of the fact that the bungalows are too far in the interior of the island. For beach lovers, this is a perfect dream, since they are not located behind the barrier of greenery, but right on the sand. And the beach on the Athuruga is still very beautiful, encircling the whole path around a small round island. Seasonal erosion is counteracted by some pumping and a couple of groynes on the west and northwest corners. Previously, on the island, rooms 1-3, enjoyed the guests by a wild popularity, as they were on a large beach close to the main building and facing sunset. Now in front of them stretched the water villas jetty and the sun sets right behind the pier, so their popularity quickly faded away giving way to the number 9-13, the choice of which is the best today. Standard level Beach Bungalows are spacious with vaulted ceilings and minimalistic decor played out in all-white walls and boxy, glass-topped wooden furniture, and have partially covered, but fully outdoor, bathrooms. Personal decks empty right out onto the soft sand and have sets of retro-modern loungers and couches, and two plastic beach chairs, plus umbrellas out on the sand. Minibars are stocked with soft drinks, water, and beer. Each room has glass doors, and a simple interior, without a TV with a wooden veranda and direct access to the decks on the sunny beach. Personal decks lead directly to the soft sand with a set of modern retro sun beds and couches, and there are also two plastic beach chairs, plus umbrellas on the sand. The rooms are located in pairs, dividing the wooden deck among themselves and are closely separated by long benches. While Thudufushi has a bridging category of Beach Junior Suite, Athuruga's next bump up goes straight to the water villas. If you upgrade to a regular Water Villa, you’ll trade the sand and outdoor bathroom for a huge overwater deck with direct access into the sea 25 water villas hosting a private large terrace with direct access to the water. All rooms are equipped with personalized climate control, tasteful furnishing including custom made rattan furniture, canopy kind size beds, Italian contemporary lighting and handmade wooden parquet floors. Each villa offers ample living space with a comfortable sofa bed, mini bar corner and coffee and tea making facilities. Expect more booze in the minibar; hairdryers with diffusers, and a vanity desk with a makeup mirror. Standout features of all Water Villas are the free in-room Wi-Fi and open-plan lounge areas, massive wooden decks with chic loungers, sofas, and table and chairs; personal iMacs; and Nestle Gusto Dolce coffeemakers. Due to the island's central location in the atoll, the sandy beach of Athuruga has retained much of its natural beauty, and is less prone to erosion occurring in most other islands in the Maldives. A wide strip of fine soft sand and turquoise waters next to house reef offers guests to wander around, relax or even play volleyball. Even with such a wide beach, the sands of the island are never filled; upscale, ergonomic, double white wicker chaise lounges are graciously stretched in pairs throughout the beach, most of them with their own thatched straw umbrellas, and some with cushions. There are also good spots of palm trees, perfectly planted, to give the place the most heavenly feeling, not too obstructing magnificent views. Before the beach bar, a volleyball net is stretched, where you can try your hand at or watch the staff games. Diamonds Athuruga resort has five different restaurants, outstanding chefs and a passion for cuisine of the very highest standards, icluding VEGAN EXPERIENCE. Beach Bungalows guests are served at the main beach front MAAKEYN BUFFET RESTAURANT for breakfast and lunch and a themed buffet dinner. The International Buffet Breakfast offers a wide selection of fresh tropical fruits and juices, homemade bread and pastries, as well as a selection of European cold starters and cheeses. Lunch menu features a great variety of fare from pizza, pasta, salads, grill, fish to a meat dishes, cooked to perfection. Water Villas guests feast on a la carte menu in the over-water Thari restaurant and bar. A luxury, innovative and superior yet relaxing all-inclusive a la carte restaurant offering a fusion cuisine, where modern European, local and Asian ingredients are combined in an explosion of flavors. This food block is much smaller and feels slightly better, although there are several chic white wicker sofas along the corner terrace where guests can have a cocktail in the fresh air. For private and romantic dinners, seafood menus including fresh lobster and prawns may be reserved at an extra charge. The Thila with a vibrant, unique and engaging setting, delicious Japanese Teppanyaki restaurant offering a memorable live cooking experience. Set in an exquisite palm-leave-thatched hut, the specialized chef prepares a selection of seafood and meat on the Teppanyaki grill. A romantic, exclusive and elaborately prepared, yet unparalleled personalized Kakuni seafood restaurant offers the opportunity to customize guests’ dining experience. Special set menus, Lobster meals or Indian Ocean dinners are available at different places to make the dinners extraordinary and remarkable. 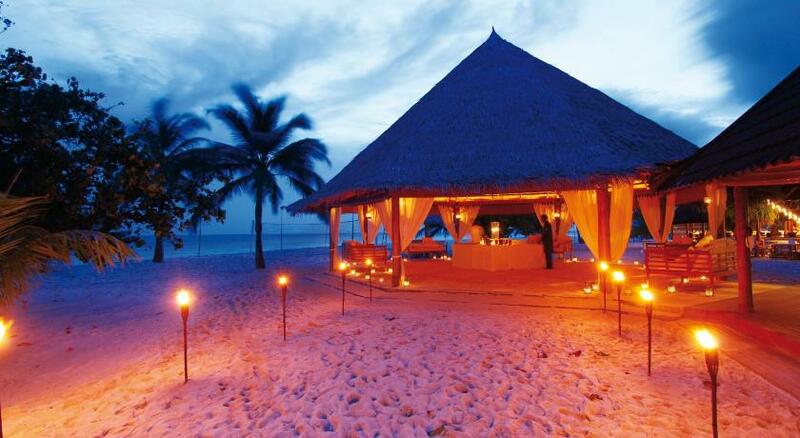 The feast can be on the beach, on the water villa terrace or in front of the beach bungalow. 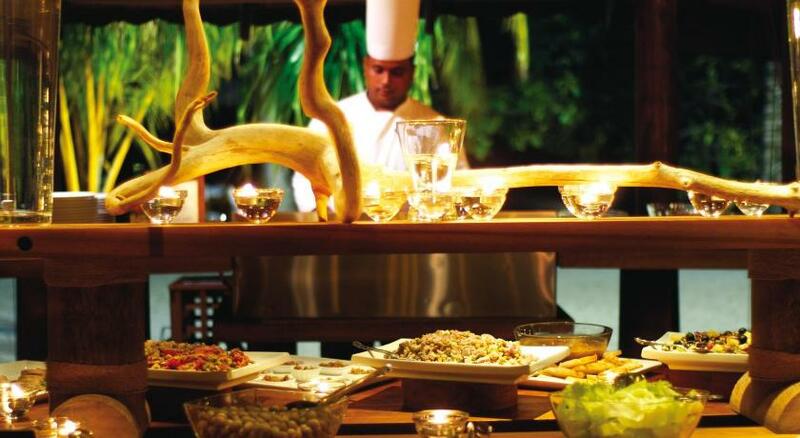 The Maldivian night takes place every Friday at 8pm, and has the aim of tasting local flavors and dishes to the guests, making the local people’s customs and culture known and living a truly local experience in the Maldives. Some of the dishes served are: Fish soup Maldivian style, Maldivian style chicken, Maldivian style coconut fish, Noodles with vegetable, Buttered mixed vegetables, Dhal curry, vegetable curry, white rice, deep-fried samosas, fish rolls, papadam Chapati with tuna, coconut and onion, Grilled fish and meat. If you want to enjoy food surrounded by beautiful scenery, you will have to choose one of the special menus for a private dinner on the beach or on the terrace of the room, or an evening special menu in the restaurant (all for an additional fee). Room service is available only for guests of water villas. And although there is a special bar and restaurant serving Water Villas guests, the hotel's main bar is located on the beach, next to the main restaurant. This is a casual, simple and stylish place with a view of the wide beach and turquoise water, and is open all day, from morning till late evening. 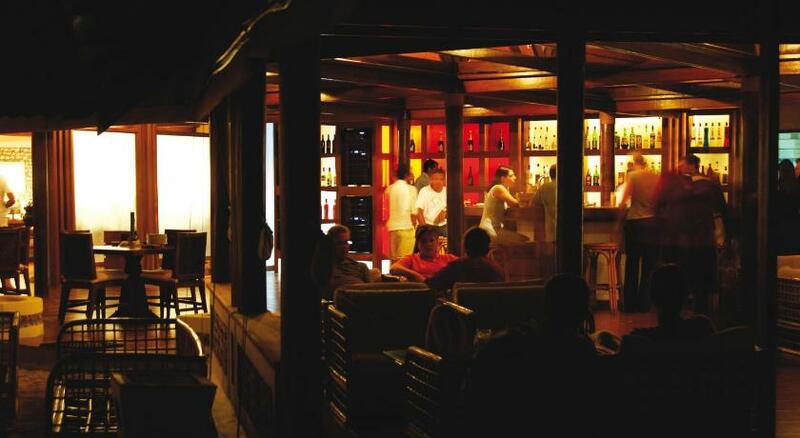 The bar has a good selection of cocktails, non-alcoholic cocktails, hot teas and wines and spirits. Top-booze and premium wines are available at extra charge, although the all-inclusive plan also includes alcohol, a selection of international wines and a draft beer Lion from Sri Lanka. If you are hungry between meals, this is the place to find afternoon tea, snacks, cookies, sandwiches and vegetarian tapas. And, although the resort does not sell cigarettes, the main bar has a choice of cigars. in all bars and restaurants. • Quality wine list available in the restaurants. • International cocktail list available at the bars. and coffee served throughout the day in all bars. • Daily Beach refreshment service. restaurant with daily themed buffet menus. • BBQ station during lunch and dinner. • Sashimi & fresh caught marinated fish during lunch and dinner. • Handmade pizza of your choice during lunch and dinner. • Homemade ice cream and sorbet during lunch and dinner. • Afternoon snacks including a selection of fresh fruit. • Catering option to assist with special dietary needs. • Special occasion celebration cakes upon request. • Selected Sparkling wine menu. • Selected Mineral water menu. • Afternoon snack served in the villa. The snorkeling in Athuruga is ideal as the reef runs close to the beach around two-thirds of the island. Guests would usually go off on either side of the short jetty and come in at 1 of the 3 buoys indicating a narrow cut-through the reef. Snorkeling trips to nearby thilas and a sandbank are arranged with the watersports centre, which run all the excursions in a personalised way. The marine biologist takes guests out to the housereef 2 times a day. Diving is fairly popular here and couldn't be more convenient. Once guests have signed up for a dive, their equipment is taken to the boat for them. After the dive they just walk away, while staff return their equipment. Having said that, the level of information on the dive sites is not so impressive. And being in the middle of the atoll means longer journeys to the outside channels. On the other hand, great thilas such as Orimas and Fish Head are all regular dives. The iDive center gives out free ocean-bound trial dives and rents go-pros to capture your experience (and they can make a DVD). In addition to all the freebies included in all-inclusive plan, the island of Athuruga offers the possibility to experience many different sports and activities, including many other features and activities to discover while at the resort. To explore the island, there are free orientation tours for new arrivals, which include drinks, snacks, and information about where in the hotel, excursions and special activities. Expect whale shark and manta rays snorkeling tours, speedboat trips through the Southern Ari Atoll, and snorkeling tours to spots like Reethi Thila and Olo Ghiri (good for spotting turtles) and Manta Point. You can also book individual excursions to the sandbanks or a private snorkelling tour in Dega Ghiri to swim with the turtles, or try fluorescent diving to see the marine life in a new light. Also on the menu is fishing, followed by a barbecue from your catch, free of charge. Leisure and sport facilities on offer: Beach Volley, water sports centre, hobbie cat and laser dinghy sailing, windsurfing and canoing If you want to do more than observe underwater, you can sign up for a fishing excursion and try to catch local grouper, snapper, or sea bass and the kitchen will cook your catch for you for free. The iDive center gives out free ocean-bound trial dives and rents go-pros to capture your experience (and they can make a DVD). In between activities, you can relax at Serena Spa is an oasis of peace and tranquillity set in a natural environment, perfect for those wishing to relax, refresh and rejuvenate mind, body and spirit. The treatments are inspired by the rich heritage of Ayurveda, the ancient Indian science of life, by European concepts such as aromatherapy and by traditional home remedies used throughout Southeast Asia. Massages and treatments combined with a stay deep in the heart of nature will make your stay a journey of regeneration. 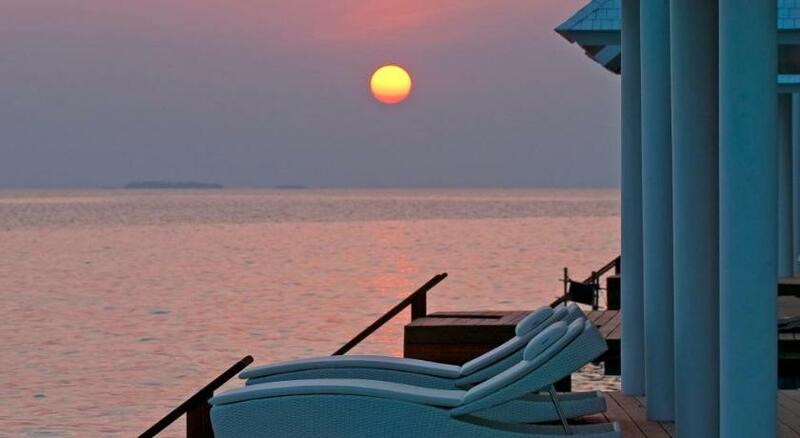 Reviews of the Diamonds Athuruga Beach & Water Villas are generally extremely positive. The rooms get high marks, especially the water villas, as being large, very comfortable, and cleaned thoroughly each day. The house reef snorkeling also gets great reviews being among the best in all of the Maldives with a ambundance of tropical fish and healthy coral. The food in the restaurants and the service also fare well in reviews, though a few guests complain that there isn't as much choice as they'd like for a longer stay. 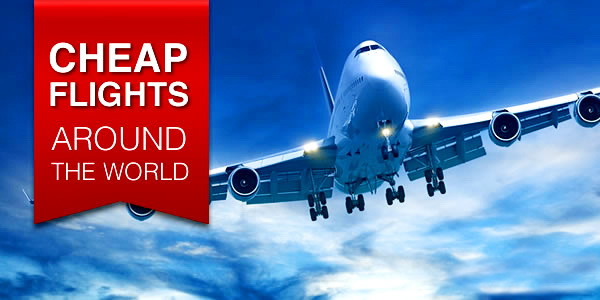 Check out at 12:00 but flexible The earliest check-in time is 14:00. The resort is more suitable for couples than for families.